It’s a vital skill when you understand the presentation title effect on an audience. When you get the right title for your presentation you can expect to benefit in three ways. Your title will promote you. The title will introduce you. Your title will boost your introduction. Because all three are vital when it comes to you attracting an audience, introducing you to that audience and introducing your material to that audience. 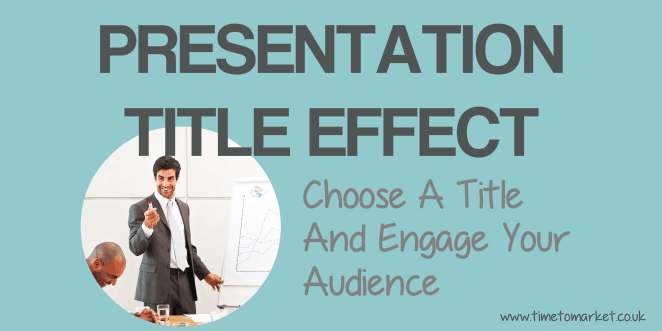 Your title will promote your presentation or speech to a wider audience. Thus, it gives your potential audience a reason to listen. Your presentation’s title helps someone to introduce you. So, you can then begin your presentation immediately. Just consider how this lengthy EU speech failed with its title. The title of your presentation gives you the best possible way to begin your speech. That’s because all the hooks and links are there. And if they are not? Then, why not consider what happens when you have an unimaginative title for a craft beer presentation. These benefits are clear enough. But how should you prepare your title? Bland or exciting? Descriptive or interesting? Perhaps it might contain some mystery? Well it might be any or all of these suggestions. But try to build a distinct benefit for your audience. How clear is it that your speech will benefit your audience? Is it clear that they will learn? Because that’s the first thing to grasp with presentation title effect. A clear benefit is vital for a receptive audience. So, if you do adopt a mysterious title (an enigma or a puzzle) then aim to explain the title and its relevance near the start of your speech. Keeping your audience guessing through your speech isn’t a good idea. Don’t delay. You can find good title source material in the worlds of art, culture and literature. Books or theatrical plays lend themselves to speech titles. “The Lady’s Not For Turning” was coined for Mrs Thatcher by the playwright Ronald Millar and is a reference to the Christopher Fry play, “The Lady’s Not For Burning”. Sports, topical or historical events can also be usefully used for title material. So, think about word plays, phrase reversal and awkward questions in your title. You can also consider alliteration and exaggeration for added effect. So what’s in a title? First, your title is a superb promotion device. Since it helps you to influence your audience before you speak. Second, it also helps you to be introduced by someone. It asserts your aptitude in your subject area. And third, a good title lends itself to a solid powerful introduction to your speech. Thus, it boosts your success. So, getting your title right helps you get your presentation right. You can learn more about the presentation title effect and other presentation skills tips on a PresentPerfectTM presentation training course.